Sri Vidya Kamachi Arts and Science College for Women, Salem has advertised for recruitment of Assistant Professor / Principal jobs vacancies. Interested and eligible job aspirants are requested to apply immediately from 13th January 2019,, upto 27th January 2019. Check out further more details below. 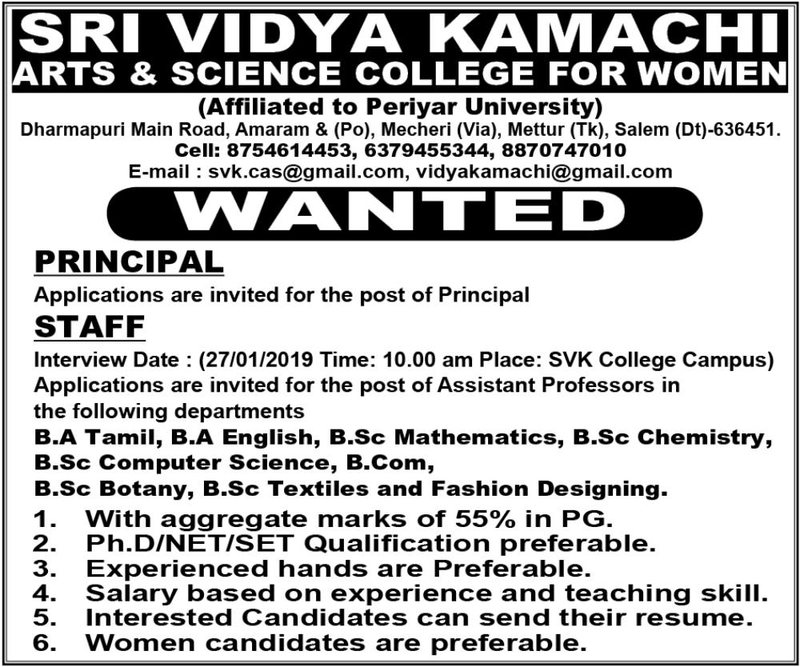 About College: SRI VIDYA KAMACHI COLLEGE OF ARTS AND SCIENCE FOR WOMEN is found by “SRI VIDYA KAMACHI TRUST” with an exuberant motivation to serve the society especially to empower women cadre. They aim to afford significant foundation for privileged education to rural women. Inculcated education in women would enable them to accomplish high limits for the fortunate life and high order of social positions along with the better quality of the society. PG with 55% of marks. NET / SET / Ph.D is preferable. How to Apply: Interested candidates are requested to send their CV along with all copies of certificates and recent PP size photos to the postal address or email address provided below.